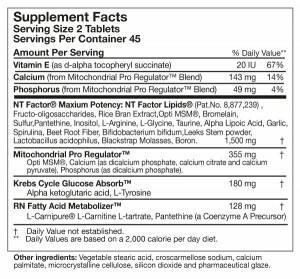 Researched Nutritionals NT Factor Energy Mitochondrial Formula promotes healthy mitochondrial membranes & energy level. Researched Nutritionals NT Factor Energy™ is a proprietary blend of phospholipids and glycolipids whose mechanism of action is to repair cellular membranes by increasing cell membrane fluidity. By repairing the membranes of the mitochondria (the energy furnaces within our cells), we allow all of our cells to increase their nutrient uptake so that the mitochondria may produce more ATP --- the body's energy fuel. This product goes well beyond the typical powder phospholipid product. Researched Nutritionals' formulators carefully selected the matrix of phospholipids required to promote healthy mitochondrial membrane function, employing a proprietary method to stabilize the lipids to maintain efficacy. The other complexes within the the NT Factor Energy™(Mitochondrial Pro Regulator™, Krebs Cycle Glucose Absorb™, and RN Fatty Acid Metabolism) are essential for increased absorption and optimization. An integral part of our product quality orientation is to go beyond raw material supplier purity claims; our third party tests proved our product is GMO-free. NT Factor Energys' efficacy is based on Researched Nutritionals proprietary method of extracting and stabilizing the phospholipids, and delivering them intact in the lower intestine for proper absorption. Suggested Use: Two tablets with each meal (6 tablets per day) for the first two months, and one tablet with each meal in month 3 and beyond. For severe fatigue, increase to three tablets with each meal (9 tablets per day) for the first two months, and one tablet with each meal in month 3 and beyond. It is important to keep with the protocol for the first two months so that enough cell membranes are repaired --- which will allow the patient to feel the difference. This equates to 2 bottles per month for each of the first two months, and 1 bottle per month thereafter. Free of: egg, fish, peanuts, crustacean shellfish, tree nuts, wheat, yeast, gluten, casein, beef, pork, corn, artificial sweeteners, artificial colors and preservatives. Microcrystalline cellulose, vegetable stearine, tricalcium phosphate, silicon dioxide, croscarmellose sodium, aqueous film coating (purfied water, hydroxypropyl methylcellulose, polyethylene glycol). I am on my third month of treatment and I have a great improvement on energy, mind clarity and a sense of well being. I suffer from Hashimoto Auto immune disease, adrenal fatigue, and candida overgrowth and have been under dr care for 3 years. It was my doctor's advice to use NT Factor Energy for fatigue and especially brain fog and forgetfulness. This product actually has brought optimism and love for life.